On Tuesday, September 5th there will be an Eyeglass Sorting session starting at 4:30 pm just before our Board of Directors meeting at Cruise Holidays of Viera. Our next summer dinner meeting will be on Tuesday September 26th at Charlie & Jake's Brewery Grille at 6300 N. Wickham Road, Melbourne, FL 32940. Charlie & Jake's is a local brew pub and restaurant is located in Suntree just off of Jordan Blass Drive. Dinner is ordered off of the menu and members are responsible for paying their own dinner bill. We meet in the separate room off of the bar. Social time starts at 5:30 pm and the meeting will start at 6:00 pm. Our dinner meetings are generally on the 2nd and 4th Tuesdays of each month and we ask that you let us know you'll be attending. Reservation contact information is listed on the bottom of our Events Calendar page . We are always collecting items for our annual Rummage event to be held on Saturday morning October 14, 2017 in Uno's Viera parking lot. If you have items to donate, please contact Lion Lynda Jackson. Donations are tax deductible. What are you doing for Valentine's Day in 2018? Please come and join us on our next Cruise Fundraiser. We always have lots of fun and fellowship AND you will be helping to provide the less fortunate of Brevard with eye exams, glasses and vision operations. More information can be found on our 2018 Cruise Fundraiser page . A full listing of Lions Events can be found on our Events Calendar page. 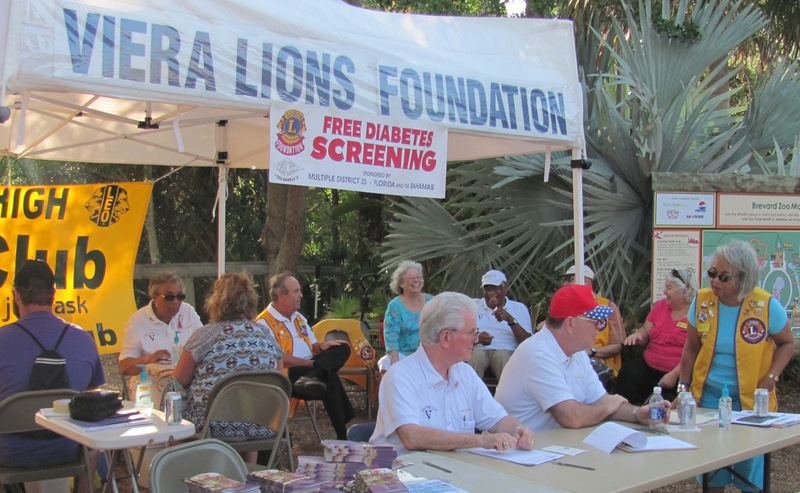 The Viera Lions Club was chartered by Lions Clubs International on August 21, 2000. Our current membership of 31 adults consists mostly of residents of the Viera, Baytree and Suntree areas in Brevard County, Florida. The Viera Lions Club embraces those committed to building a brighter future for our communities. We provide eyeglasses, sight related operations and hearing aids to those in our area unable to afford them. We have free public screenings for Diabetes, which is a leading cause of blindness in our nation. We provide back to school supplies for local schools, plant trees and sponsor Peace Poster contests. We stand ready to assist during times of disaster and stay as long as there is a need. Our members donate our time to help those less fortunate. Our newest project is vision screening for preschool aged children. Our Motto is "We Serve". The Club Projects page contains some of our community activities.